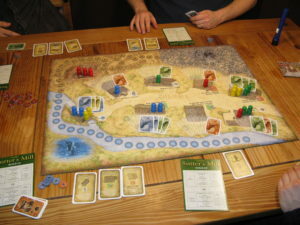 Sutter’s Mill is an action selection, resource management game by Marco Teubner, published in 2008 by Mayfair Games. Players experience the boom and fall of the Californian gold mining industry during the mid-1800’s. 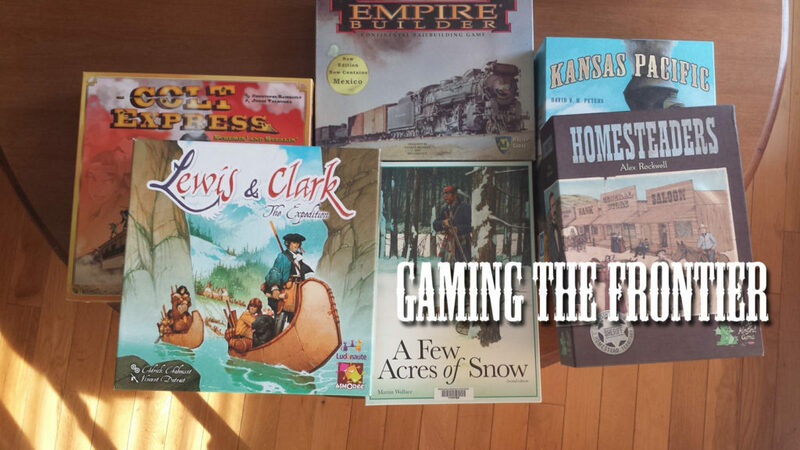 In this fourth interview for my Gaming the Frontier series, I am excited to be joined by German game designer, Marco Teubner, who tells the story about creating Sutter’s Mill. Marco Teubner (MT) My name is Marco Teubner. I am 44 years old, married and I have three wonderful kids. I studied cultural sciences at the University of Hildesheim and I work fulltime as a freelancer game author for 16 years now. (MS) What is the story behind designing Sutter’s Mill? 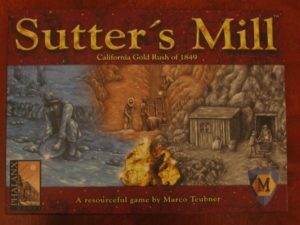 (MT) I designed the game Sutter’s Mill in the years 2006 and 2007. It was then published in 2008 by Phalanx Games Deutschland. The main concept behind this game was the idea to make a game, that is separated in two phases: a construction and a deconstruction phase. In many so called civilization building games, most of the time you build up a civilization to a certain amount of victory points. I instead wanted to create a kind of game, where you build up something and then find the right time to deconstruct the progress and bring all back to the beginning. This timing, to find the right moment to switch from building up to bringing down was the main focus of the game developing progress. So therefore I was looking for a suitable topic. Then I found the stories of the gold rush era. (MS) What (if any) type of research about the American Frontier did you do when designing your game? For example, can you list any books, articles, or experts that you consulted with to gain a perspective about the American Frontier? (MT) I found the story of Mr. Sutter and the discovery of the first nugget that led to the first gold rush in the West. Therefore, I searched for more information and found a lot of good stories on the web. I started at wiki and then visited the official sites of the national park and national museum for American history. I visited a lot of websites, I cannot remember anymore exactly which of them. (MS) Would you say Sutter’s Mill attempts to capture more of a “realistic” or “romantic” sense of the American Frontier? Why? (MT) Overall, it is just a game. So the aim was not to design a realistic and historical correctly image of this time period. But wherever it was possible, I tried to stay to the facts. And of course the use of an historical setting for a game is most of the time a more romantic view to history. When you play games, you are most of the time in a positive mood and so the topic is going through a kind of transfiguration. (MT) No, because first there was the main structure (mechanic) of building and deconstruction, and then came the theme. During the developing process it was a kind of back and forth between mechanic and theme. For example: I found out that the methods of gold digging changed during that time. First you had your pan and shovel, then more or less the whole mountain slope was washed off before they started to build mines. I found out that I could use this information for my mechanics. (MS) What type of experience do you want players to have from playing Sutter’s Mill? If your game were to be used in an educational context (for example, a high school history class) what would you hope students learn from your game? (MT) Most of all they should have fun! It is a game, and it’s supposed to be a game. That does not mean that games (and also Sutter’s Mill) could not lead you to an interest in historical themes. I wrote a short text about the theme of the game. And for me, it was very important that the publisher put this text into the game. So in a best case, the people play the game, discover the historical theme, then find the short text in the rulebook and from there on start to make their own research. I think, that would be the best that could happen to game like mine. (MS) Does your game feature any racial or class tension (White Americans vs. Chinese or Mexican Americans, company owners vs. hired workers, etc.)? If so, how did you portray that tension? And how do you think your game compares to how other media (film, books, etc.) about the Frontier treats this subject? (MT) No, not in the game. (MT) No, just play, have fun and start to discover by yourself. I am deeply thankful for Marco Teubner taking the time to answer these questions about Sutter’s Mill. 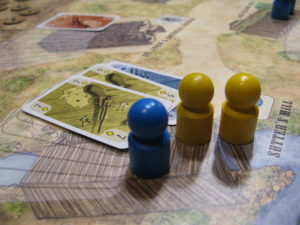 For more information about the game, please visit the game’s entry on BoardGameGeek.com.